I had been looking for an affordable, lighted magnifying mirror after having seen a lovely model in one of the hotel bathrooms we recently stayed at. And around the same time I was contacted by Pebble Grey with a chance to review their Elko LED Magnifying Vanity Mirror. Needles to say, I grabbed the chance. Pebble Grey sell an extensive range of bathroom mirrors, cabinets and accessories - all beautifully designed, high in quality and priced affordably. I have had the Elko LED magnifying mirror for a few weeks now and I love it. This free standing mirror has a tiltable mirror face with 3x magnification and gives a subtle glow using energy efficient LEDs. The size of the mirror is perfect - it gives a wide view of my face and makes it easy to apply eye liner. Even tweezing my eyebrows has become such an easier task due to the 3x magnification. The LED lights do not put off much heat but give enough subtle glow to do the job accurately. I also like the mirror's contemporary design and finish. It would look good on any vanity table. 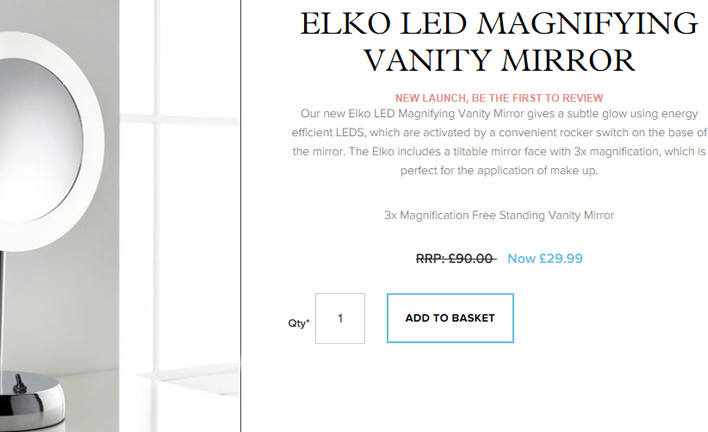 Overall, we like this Elko LED magnifying mirror. It is ideal for bathroom (if you have mains socket in there) and vanity tables. The LED lighting is perfect - it allows you to see a good reflection and the 3x magnification gives you a nice close up view. The mirror retails at £90.00 but at the time of going live with this post, it is available for £29.99 on Pebble Grey's website.